Student: Did you read this, Monday? AG: Yes, I read it . I just want to get us.. you know, get us all on the same set of papers. Got it? Now you want to.. When you’re all settled, we can do that…ok.. shoot.. now which one is that and what’s it called? Student: Ode Five. Book One. AG: That’s not a Sapphic. Quis multa gracilis te puer in rosa/perfusus liquidis urget odoribus/grato, Pyrrha, sub antro?/Cui flavam religas comam,/ simplex munditiis? Heu quotiens fidem/mutatosque deos flebit et aspera/nigris aequora ventis/emirabitur insolens/ qui nunc te fruitur credulus aurea,/qui semper vacuam, semper amabilem/sperat, nescius aurae/ fallacis. Miseri, quibus/ intemptata nites. 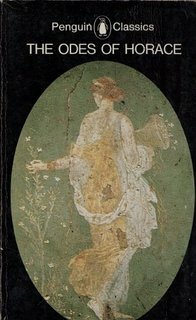 Me tabula sacer/ votiva paries indicat uvida/ suspendisse potenti/vestimenta maris deo.